#532 Sandals & Ben on TV. 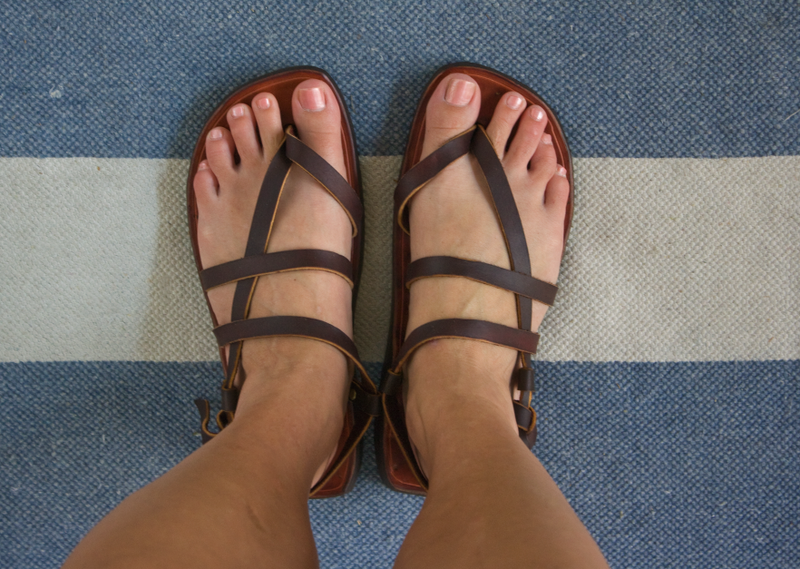 – Laurel Mercantile Co.
Now reading: #532 Sandals & Ben on TV. #532 Sandals & Ben on TV. You might be thinking it’s a little early for the blog, right? Well all the good stuff happened this morning so I thought I would go ahead and share it with y’all in case you have nothing better to do at work right now. This morning I was in an out of sleep as Mitter Ben was quietly shuffling around in our room getting dressed for the early show on WDAM. I smelled his shampoo at 4:30 am, and his cologne at 4:55 am when he gave me a goodbye hug, and I was out like a light as soon as the door closed behind him. They interviewed him about Cruisin’ Main Street, the annual car show we put on every June for Laurel Main Street, which Ben is the president of this year. With heavy eyes, I drove like a zombie to mama and daddy’s at 6 on the dot to see it since we don’t get local channels on DirectTV and the 3 of us watched it together before daddy ran out the door for work. I starched and ironed that shirt last night like a good little wife ought to. Even though I am terrible at ironing and Ben would rather do it himself so he looks decent. But I did okay. It only took me 20 minutes. And he gave me extra hugs for doing it. I got the creases on the sleeves and all. Too bad you can’t tell it on TV, huh? Then the doorbell rang at 9:30 on the dot (my daily date with Misty, the mail girl) and she had a long awaited goodie for me. You know about me and St. Augustine, right? 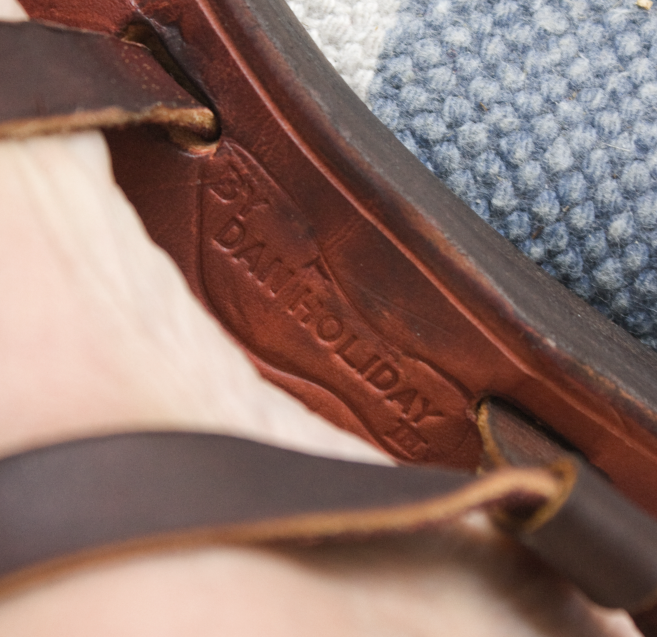 Well back in May when we went with Tom and Allison, I decided to finally break down and just pay the money to get a pair of bespoke, handmade leather sandals from Dan Holiday—something I’ve been wanting for years now. I bought a cheap imitation on etsy last year after we visited his shop on a cobblestone side street in the oldest city, but the imitations were just that— they had a similar look, but were cheap and uncomfortable. It costs $165 for him to personally trace and map the contours of your foot and toes, then a few weeks for him to make a custom pair of sandals just for you. I was too cheap to do it last year, but my belief has always been that if you still think about it a day, a week, a YEAR after you saw it in the store, you should have bought it. So. We made the drive to St. Augustine on our way to Charleston and did it. He’s a big man—stone deaf, abrasive and scary with a thick white mustache and a Yankee accent and he doesn’t mince words when you come for a fitting. Little was said as he drew my foot (because he didn’t hear me talk or pretended not to), but I didn’t mind because he makes the finest shoes on earth. And here they are! 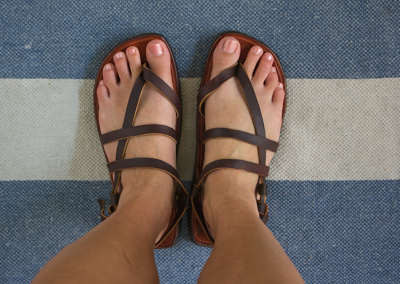 The arch supports hug my foot which is the reason I finally got a pair of custom sandals. The cutesy cheapos from American Eagle have exactly no arch support which makes them pretty uncomfortable after any substantial amount of walking. I think it’s gonna be a good day.